Today, PPIC released “Water and the California Economy,” a report that presents the consensus view of 15 experts* on the role of water in California’s economy, key areas of economic vulnerability, and the priorities that policymakers, business leaders, and water managers must address to ensure that the state’s water system does not impede economic progress. This blog entry summarizes the report. Discussions in public forums and policy circles often include statements emphasizing the role of water in California’s economy. Many observers assume that the state’s economy will suffer greatly—or indeed is already suffering—from water shortages related to droughts, regulatory cutbacks, and insufficient water infrastructure development. Clearly, some amount of water is essential for virtually all types of economic activity, just as it is essential for daily human life. But how important is water—now and in the future—as a driver of California’s economy? And how vulnerable is the state’s economy to weaknesses in its water system? Despite many innovations in water management in recent decades, risks to the economy remain. Water is indeed vital to the California economy, but not always in the ways one might think. Water is a scarce resource, subject to numerous and competing demands—including growing demands for environmental uses. And the state essentially stopped expanding its vast surface storage network several decades ago. Yet the economy has weathered several droughts, and enough water has been available to support a growing population and economy, thanks to management improvements, including water use efficiency, water markets, underground storage (or “banking”), and reuse of highly treated wastewater. Another reason for resilience: California’s economic structure has been changing, making it less reliant on water-intensive activities. For instance, agriculture and related manufacturing of agricultural commodities account for nearly four-fifths of all business and residential water use—but make up just 2 percent of state GDP and 4 percent of all jobs. 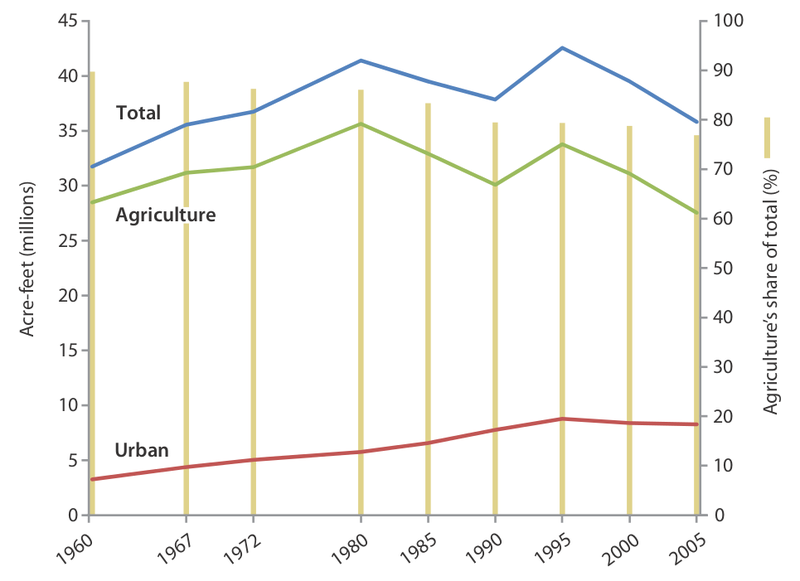 Water management innovations and the evolving structure of California’s economy have enabled California’s real economy to grow, even though total business and residential water use appears to have flattened since the early 1980’s (Figure 1). SOURCE: Author calculations using data from the California Department of Water Resources. NOTES: The figure shows applied water use. “Urban” includes residential and nonagricultural business uses. Pre-2000 estimates are adjusted to levels that would have been used in a year of normal rainfall. Estimates for 2000 and 2005 are for actual use; both years had near-normal precipitation. Estimates omit conveyance losses (6–9% of the total). 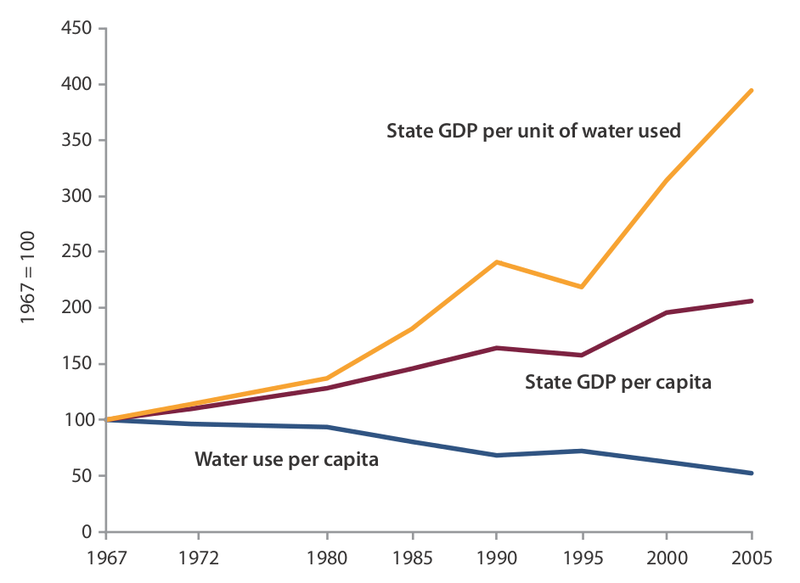 Over the past four decades, per capita water use has been halved, while real per capita GDP has doubled. Each unit of water now generates four times more economic value than it did in 1967 (Figure 2). SOURCE: Author calculations using California Department of Water Resources (water use), California Department of Finance (population), and U.S. Bureau of Economic Analysis (state GDP). NOTES: Water use estimates are for applied use in the agricultural and urban sectors. Pre-2000 estimates are adjusted to levels that would have been used in a year of normal rainfall. Estimates for 2000 and 2005 are for actual use (both years had near-normal precipitation). Estimates omit conveyance losses (6–9% of the total). GDP was converted to real values using the GDP deflator for the nation as a whole. But California’s current water system raises several red flags. Catastrophic interruptions of water supplies from earthquakes and floods could cause large short-term losses; unreliable supplies could also jeopardize business and infrastructure investments that support economic growth. Catastrophic flood risk and severely overdrafted or contaminated aquifers are major concerns in some regions. California is also susceptible to increasing costs from climate change, which is expected to raise environmental demands on the water system, reduce “free” seasonal water storage in the mountain snowpack, and increase the size and frequency of coastal floods. Many of these changes require strong, proactive state leadership. But stakeholders, especially the business community, have a vital role to play, by engaging in the policy process and helping to ensure that California undertakes the water reforms needed to support a healthy and prosperous economy. The report’s authors are Ellen Hanak, Senior Policy Fellow at the Public Policy Institute of California; Jay Lund, Ray B. Krone Professor of Environmental Engineering and Director of the Center for Watershed Sciences at the University of California, Davis; Barton “Buzz” Thompson, Robert E. Paradise Professor in Natural Resources Law at Stanford Law School and Perry L. McCarty Director of the Woods Institute for the Environment at Stanford; W. Bowman Cutter, Associate Professor of Economics at Pomona College; Brian Gray, Professor of Law at the UC Hastings College of Law; David Houston, Managing Director and Head of the Water Infrastructure Group at Citigroup Global Markets; Richard Howitt, Professor of Agricultural and Resource Economics at UC Davis; Katrina Jessoe, Assistant Professor of Agricultural and Resource Economics at UC Davis; Gary Libecap, Distinguished Professor of Corporate Environmental Management at the Bren School of Environmental Science and Management and Department of Economics at UC Santa Barbara; Josué Medellín-Azuara, Research Scientist at the Center for Watershed Sciences at UC Davis; Sheila Olmstead, Fellow at Resources for the Future in Washington, D.C.; Daniel Sumner, Frank H. Buck, Jr. Professor of Agricultural and Resource Economics at UC Davis and Director of the UC Agricultural Issues Center; David Sunding, Thomas J. Graff Professor of Natural Resource Economics and Policy at UC Berkeley; Brian Thomas, Managing Director for Public Financial Management; and Robert Wilkinson, Adjunct Professor at the Bren School of Environmental Science and Management at UC Santa Barbara. This entry was posted in California Water, Economy, Floodplains, Planning and Management, Sacramento-San Joaquin Delta, Sustainability, Water Supply and Wastewater and tagged California, economics, floodplain, Jay Lund, levees, UC Davis Center for Watershed Sciences, water planning, water supply. Bookmark the permalink.